With the nice spring weather finally settling in, it is a great time to get started on those fun outdoor projects. Whether you are revitalizing the lawn after a rough winter or building something new for the yard, it is important to get organized first. Clutter can build up quickly in the garage or shed, so it is helpful to have a system in place. A simple solution to hold the variety of tools and other miscellaneous yard supplies will go a long way. With a little help from Sterilite, your spring projects will be off to a great start! The Sterilite 4 Drawer Unit is a versatile storage solution that is ideal for use in the garage, shed or basement. It is perfect to hold all of your tools and hardware items, while keeping clutter out of sight. It is also ideal for outdoor supplies typically found in the shed. 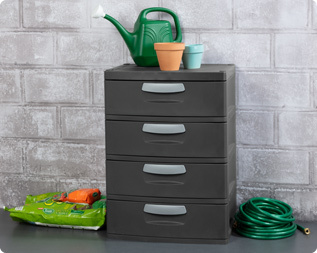 The four large-capacity drawers are great for organizing gardening tools such as spades, big bags of fertilizer or hand shears. The wide, ergonomic handles offer a secure grip area for opening and closing the drawers easily, while hidden rollers help to ensure drawers glide smoothly even under heavy loads. The solid sided walls offer strength and durability, while the heavy-duty plastic construction ensures that the unit will not rust, dent, peel, or chip. Use this 4 Drawer Unit along with shelving or cabinet items to create a coordinated garage solution! These items work great with one another and are perfect for organizing any cluttered area. Plus, it will allow you space to get your car back in the garage! The Sterilite 5 Shelf Unit offers ample shelf space for items you would like to leave out in the open that are used often. The 4 Shelf Cabinet features adjustable shelves and is great to keep those taller items out of sight. Together these storage solutions not only open up room in storage areas, but will also look great. Sterilite's line of hardware storage is just what you need for a productive start to the spring season! 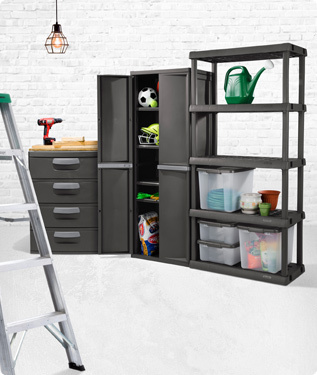 The Drawer Unit is ideal for organizing outdoor tools, yard supplies and more to help keep clutter out of sight. The Sterilite 4 Drawer Unit is a great complement to the 4 Drawer Cabinet and the 5 Shelf Unit creating a complete garage storage solution. New Home, New Organizing Plan!